This page showcases space images from various sources, missions and targets. These images change often so check back! PASSC News includes the activities the of PASSC team and updates to the Earth Impact Database. "Enhanced NAVCAM image of Comet 67P/C-G taken on 27 March 2016, 329 km from the comet nucleus. In February and March, Rosetta spent several weeks at very close distances from the comet nucleus, which overfilled the field of view of the NAVCAM, providing us with striking views of the surface. During the current excursion, instead, we can enjoy again a view of the full nucleus and the environment around it. In this CometWatch image, the small comet lobe is on the left and the large one on the right. The image was taken at a very large phase angle of about 159 degrees, meaning that the comet lies between the spacecraft and the Sun, and that all three are very close to being on the same line. In this configuration, the nucleus appears backlit, with only a few portions of the illuminated surface visible from this view – in the upper and upper right part of the nucleus. 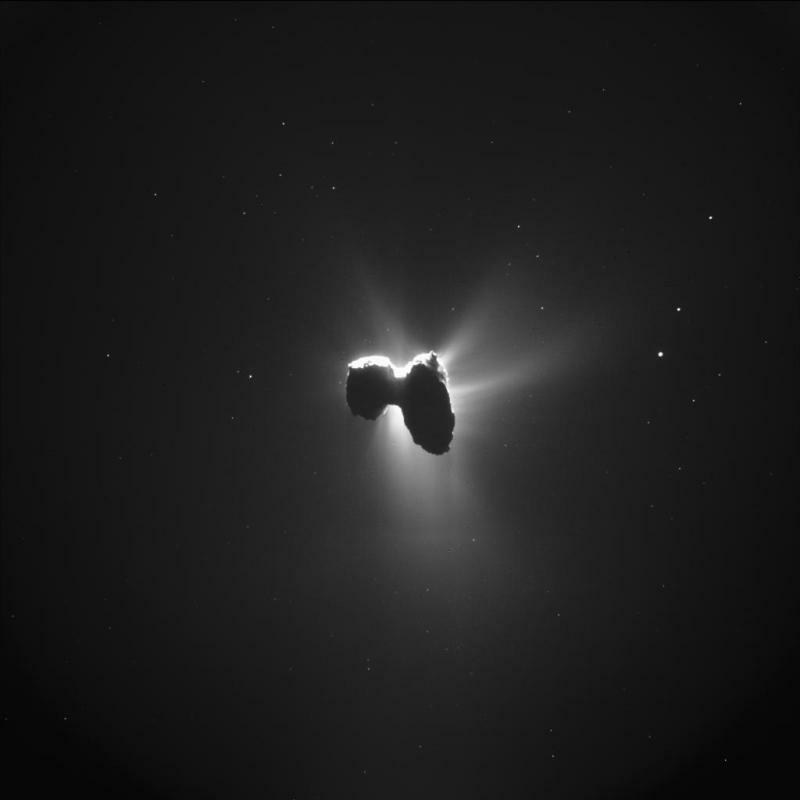 Thanks to the combination of a long, four-second exposure, no attenuation filter and a low-gain setting on the analogue signal processor of NAVCAM (a setting that is used to image bright targets), the image reveals the bright environment of the comet, displaying beautiful outflows of activity streaming away from the nucleus in various directions." Image Credit: ESA/Rosetta/NAVCAM. Click here for image page and other images of Comet 67P/C-G.
Click here for further reading about this photo. "Most planetary rings appear to be shaped, at least in part, by moons orbiting their planets, but nowhere is that more evident than in Saturn's F ring. 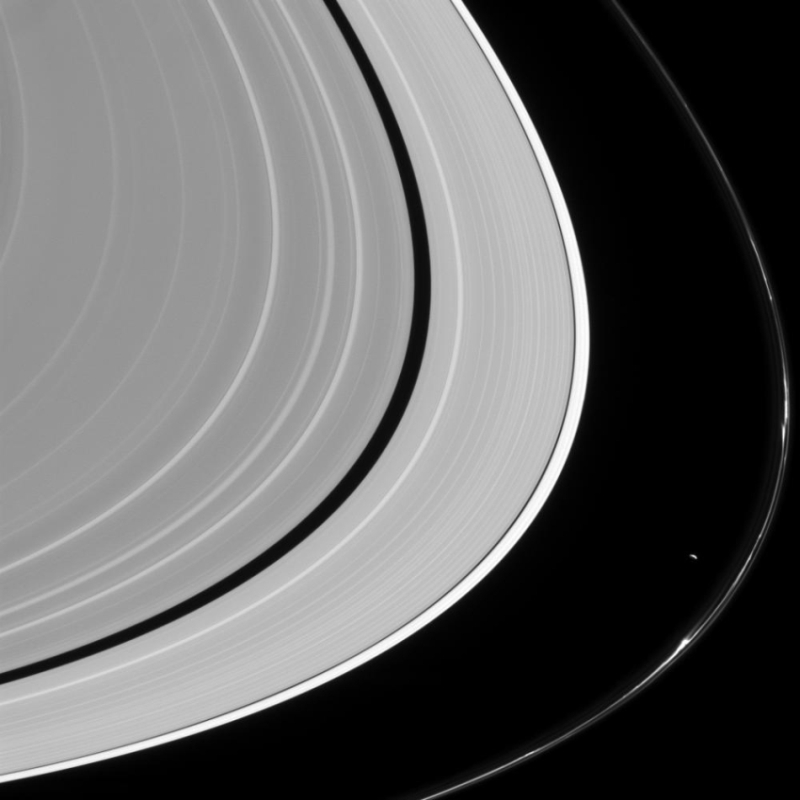 Filled with kinks, jets, strands and gores, the F ring has been sculpted by its two neighboring moons Prometheus (seen here) and Pandora. Even more amazing is the fact that the moons remain hard at work reshaping the ring even today. This view looks toward the sunlit side of the rings from about 12 degrees above the ring plane. The image was taken in visible light with the Cassini spacecraft narrow-angle camera on Feb. 21 2016." Image Credit: NASA/JPL/Space Science Institute/ESA. Click here for image page, and click here for further reading about Saturn's rings. The International Space Station completed its 100,000th orbit on May 16th, 2016! Click here. David Saint-Jacques will be the next Canadian in space. Click here or here to learn more. Magnetospheric Multiscale mission. Click here. Want to follow NASA scientists and engineers? Visit NASA's eyes to find out how. "Bright spots and color differences revealed on Ceres". Read more. NASA's Fireball and Bolide report: Click here. "If the Moon Were Only 1 Pixel"; Click here for a "tediously accurate scale model of the solar system". Changes in Jupiter's Great Red Spot captured by Hubble's Planetary Portrait. Read more. "Dark Matter Dwarf Galaxy Found Hidden in Spacetime Warp". Read full article here. Global Geologic Map of Ganymede released! Click here. Photos of Pluto from the New Horizons mission show that 'It's Complicated'; Find out why here. "The Rock that Appeared Out of Nowhere on Mars". Read more. Click here to see a colorized flyover movie over the two largest seas on Saturn's moon Titan, from NASA's Cassini mission. which is still a huge mystery regarding Mars. "Top 20 Awesome Facts About Space". Click here. Click here to read about NASA-inspired innovations that apply to everyday life! "NASA Spinoffs". Cassini-Hyugens mission has confirmed speculation of hydrocarbon lakes and seas on Titan; read more. The Kelper-223 System may provide clues to the migration of some planets in our solar system. Read more. Are you a non-scientist interested in helping scientists map rocky planets? Click here for information about how to become a Citizen Scientist! Are you a Graduate Student in planetary science? We have extra copies of USGS I-MAPS available for distribution. Please Click here for more information and to request a copy**. Please indicate what school/college/university/course you are affiliated with. Click here for MSL Curiosity Rover "What's New". Click here for the official "Martian Diaries" Blog! Click here for MSL Daily Weather Reports from Mars! Click here for more information about REMS (Rover Environmental Monitoring Station). The PASSC team at UNB is part of the APXS instrument team: Canada's instrument! Click here for information about the APXS and MSL from the Canadian Space Agency. Click here for information about our team's MSL activities in PASSC news.